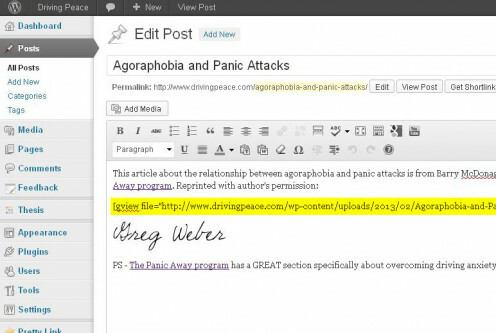 In a previous Hub, I showed you how easy it is to insert a PDF into WordPress as a simple text link. This is fine if you just want to create links to some PDF documents. But what about your visitors who either don't have the Adobe Acrobat PDF reader, or don't have the proper version installed on their computer? 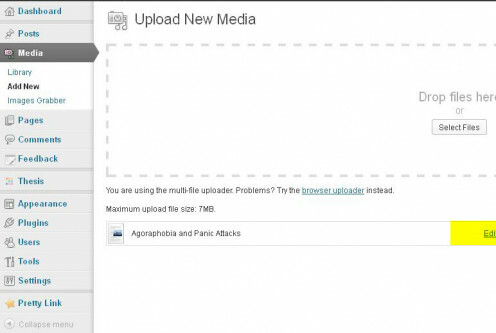 Forcing your website visitors to download and install upgrades to Acrobat can turn into a BIG hassle for them. Always remember the first rule of good web development: make the user's experience as easy, simple, and painless as possible. In this Hub, I'll show you how to actually embed a PDF in WordPress, rightinto the body of your posts and pages using a Google Docs plugin. Not only does this allow your visitors to read PDFs directly on your webpage (thus eliminating one extra mouse click), it also requires no installations or upgrades of Adobe Acrobat. In fact, the visitor doesn't even have to HAVE Acrobat at all. And here's the best part: this plugin doesn't require a Google Docs account either. Pretty cool, huh? 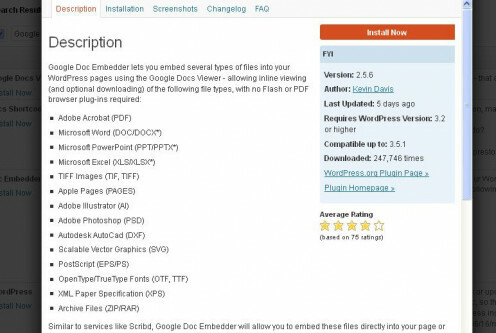 First off, let's install the plugin that will let us embed a PDF in WordPress. 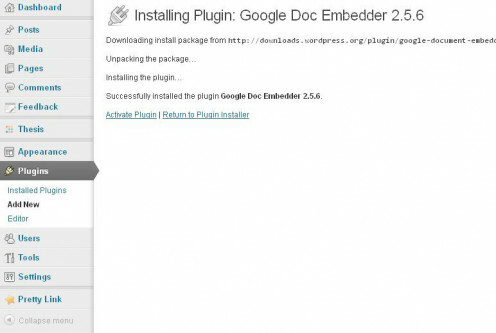 Search for "Google Docs Embedder" to locate the proper plugin. Click "Details", then click the red "Install Now" button to install the plugin. Note: Make sure the plugin is compatible with your version of WordPress. If not, you may need to upgrade your WordPress installation. 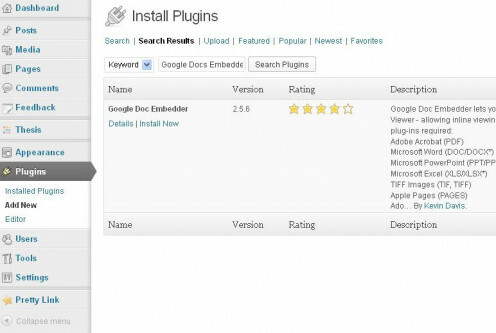 Make sure the plugin is compatible with your version of WordPress, then click "Install Now." Once the plugin has finished installing, click the "Activate Plugin" link. Click "Activate Plugin" after the installation finishes. Go back to "Installed Plugins" in the left-hand menu, then click the "Settings" link under Google Doc Embedder. 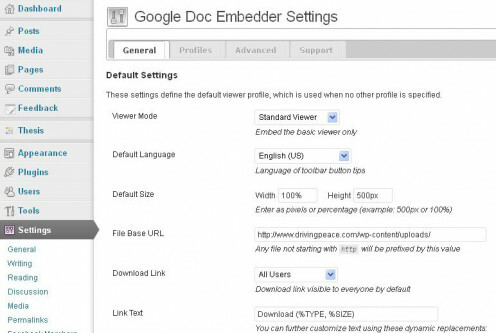 Click the "Settings" link under Google Docs Embedder. The settings screen allows you to configure the plugin for your website. You can choose the standard or enhanced viewer, set file types and sizes, integrate the viewer with Google Analytics, and find links to support documentation. 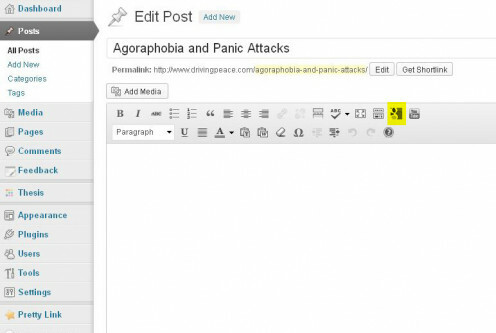 Use the tabs to configure the plugin for your website. 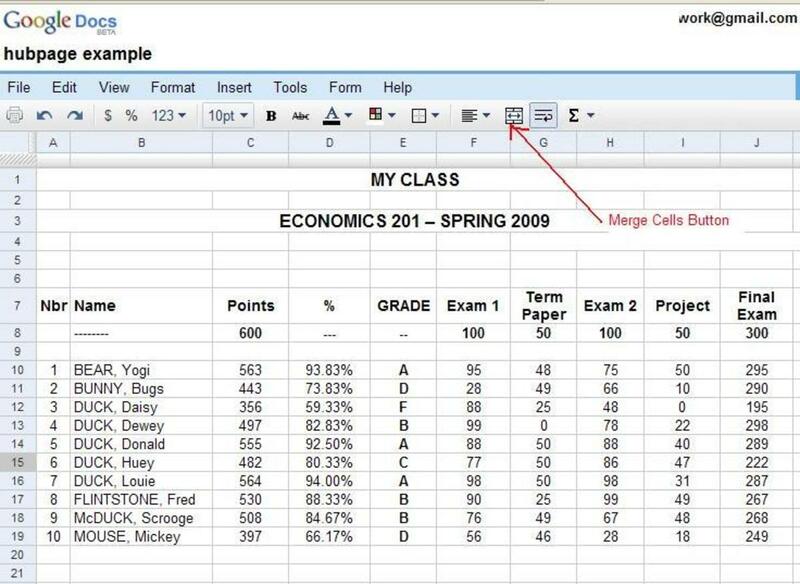 Upload your PDF, then click the "Edit" link. Grab the PDF's URL from the edit screen. 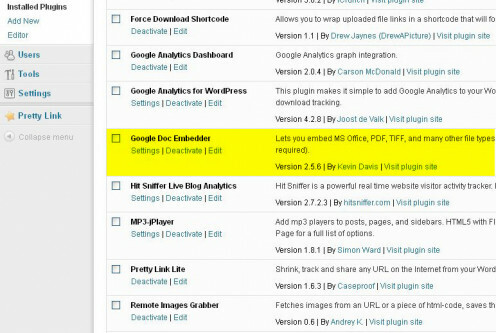 Click the Google Docs icon on the toolbar to open the embedder plugin. 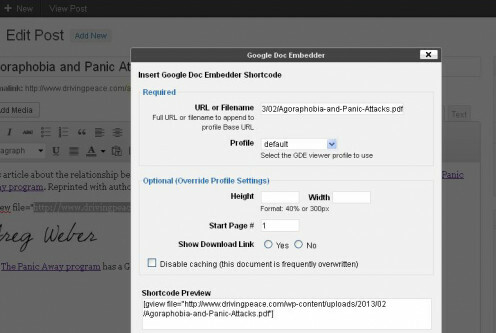 Paste the PDF's URL in the field to generate the plugin shortcode. Now click "Insert." 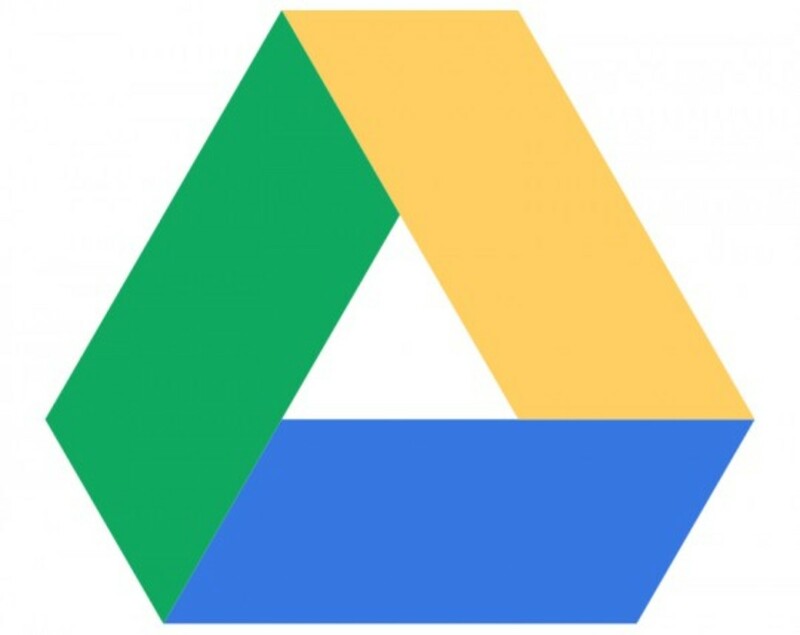 The Google Docs plugin shortcode will appear in the body text of your page or post. Note: Make sure you remember to "Update" the post or page to save your work. The shortcode appears in the body text. Don't forget to update your work! Ta daaa! That's it. You've now successfully embedded a PDF in WordPress, and your visitors can read it with no Adobe browser extensions whatsoever. You've just made your website an easier, more user-friendly place to visit! PS - I'd love to hear suggestions for other ways to embed a PDF in WordPress. Do you have a favorite plugin or other method you like to use? Please share it below. This worked perfectly, thanks so much! That's a great suggestion! Thanks Phil! 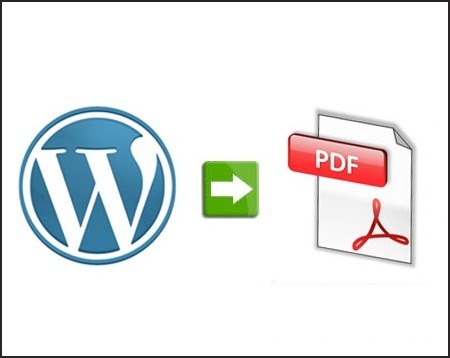 Another way is to convert your PDF into JPEG using say Jing Screen Capture and then inserting that JPEG into your WP page or post via the media insert button.